Part 5 of CBC's investigative series Breakdown looks at how social agencies and schools around Alberta are dealing with increasing demands for mental health services for young people. Social agencies and schools around Alberta are dealing with increasing demands for mental health services for young people. One local mother has had to deal with a lot of anxiety and depression in her home as both her 17-year-old son and her 12-year-old daughter suffer from anxiety and depression. "He was scared to leave the house. His self-esteem was in the tank," said Barb, who CBC News has agreed not to share her real name to protect her children's identity. "He didn't want to talk to anybody, he didn’t want to talk to the family. It was a struggle to get him to do anything," said Barb. As for her daughter, Barb says it was a struggle to get her to go outside. "[She] spent most of her days when she was at school worrying on the various ways that I was going to die." Barb's children are part a growing number of youth looking for mental health help. "I think we are looking at more and more young people who are identifying the word stress," said Madelyn McDonald of Wood's Homes. McDonald says when she started at the agency in 1995, they served 400 young people a year and now it's more like 20,000. Schools are feeling the pressure too. Barb's son switched schools to access a special program called "The Class." It's like a safe haven for students, a room they can retreat to with access to a teacher, support workers and even a psychiatrist. "He's back to the child that we knew, he’s back to joking around with people, talking to people," she said. Barb says it's worked so well for her son, she's trying to get her daughter in the program, too. Workers on The Alex youth health bus see the demand increasing for services all the time. With a doctor, nurse and outreach worker onboard, this medical clinic on wheels travels to seven high schools around the city. "I do know that they have difficulty accessing mental health services through the more traditional routes," she said. 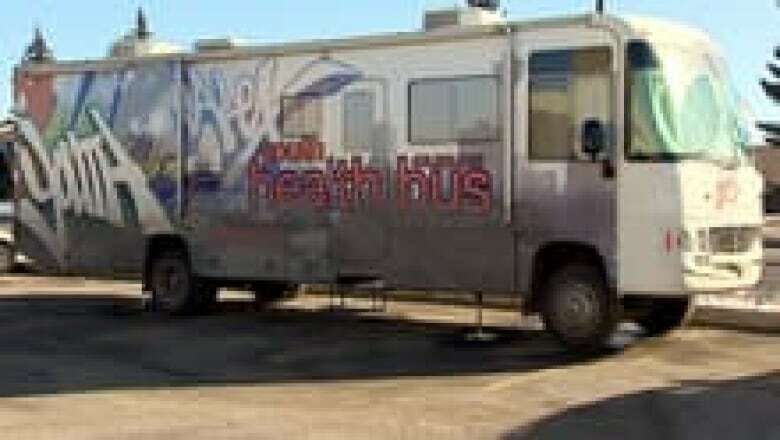 The bus connects the youth with services in the community. "If we can say, ‘look’ if you need a ride to this service we'll try to arrange that through our outreach program,’ than that actually gets the kids there," said Darragh. But because of the shortage of adolescent psychiatrists, appointments can take months to get. Darragh says those students are provided with medical care and counselling while they wait. Join the conversation online. Tag your tweets with #cbcmentalhealth to connect to others talking about youth and our overburdened mental health system.